Claude Blanchemaison, a former French envoy to Russia, has commented on Macron’s visit to Russia, and much more, in an interview with Sputnik. 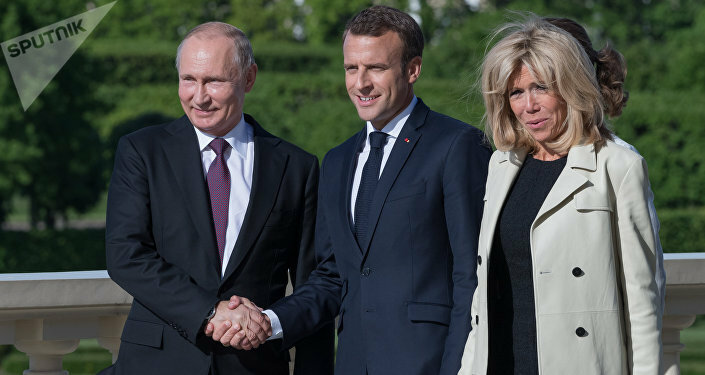 "Taking into account Trump’s attitude and the US’s withdrawal from a number of multilateral deals and agreements, as well considering the fact that some of our European partners are currently in a somewhat tight political situation, Emmanuel Macron is arriving in Saint Petersburg as a representative for Europe." Blanchemaison believes that Macron will be able to communicate to Putin the idea that Russia is a European country. "Russia is European in its culture, in its history; Russia has very tight economic ties with the European Union." "Macron may no doubt act as a European envoy, chose task is to restore the relationship, where there will be more trust than suspicion." He also thinks the meeting will be productive with regard to the Syrian issue. "It will be in any case productive, as the situation hasn’t reached a deadlock. It is changing. And now, after the war ended in a victory, it is necessary to strive for peace. To attain peace, a peace conference should be convened, which will determine Syria’s would-be regime and solve the issue of the country’s territorial integrity, as well the future political process inside Syria, which will become a guarantee of people." "Russians have their own ideas over this matter, they are very active, with regard to Syria Peace Talks in Astana, Kazakhstan, in particular. Although the latter might have yielded results, they seem to have run their course to some extent." He said that the international community should perhaps return to broader talks in Geneva or somewhere else, with all the parties involved in the Syrian standoff, the five permanent UNSC members in particular. Blanchemaison also touched upon Ukraine, saying that no one doubts that the Russian-Ukrainian border in Donbass should be restored. The border is virtually open, if not erased completely, according to the diplomat. "Poroshenko says that he cannot put to a vote the issue of decentralization for the sake of two districts in Donbass, which must become the preliminary condition for restoring this border with Russia." He went on to stress the necessity to continue exerting pressure on Poroshenko to make him put the aforementioned issues to a vote. "It’s perhaps possible to facilitate the virtual reconstruction of the border with the help of, for instance, international peace groups. There are options. This could be UN Peacekeeping Forces, why not, ‘blue helmets,’ if everyone at the Security Council agrees to vote for the respective resolution, or some others."